It's not as bad as some of the other reviews make out. It is on a hill, so can be a bit hard on the legs walking back up to it. The one drink per person all inclusive isn't as bad as people make out. The queue's aren't usually more than about 3 people and they will sometimes let you take drinks for your wife or husband once they get to know you. The entertainment is usually the same man with a keyboard playing old songs and you usually get a parrot show during the week. Oh and the food is a bit samey, but you can usually find something worth eating and you can get as much as you like. I put a good few pounds on eating the food in the hotel and never did without. All in all, it's a cheap family holiday that isn't really that bad, it's like a late 1970's hotel that caters for other countries as well as the English. Hotel tip: Take an empty water bottle with you down to breakfast and fill it up, saving you having to buy water for the day. I and my wife are experienced holiday makers with enough common sense to read reviews from other travellers before embarking to a destination.Obviously our research was not extensive enough.A pleasant welcome from reception staff.And a hearty greeting from the cleaner.Then everything went down hill from then on.On entering the dining room we received a grunt and a glower from the person monitoring the door.The food was utterly disgusting.It was quite obvious to a blind person that some of the food was reheated from a previous meal.Breakfast was always cold and unappetising as was most meals on offer.Our experience of the all inclusive package was diabolical.Drinking time was curtailed after the Spanish gentle folk had retired to bed.Often ranging from 10.45pm-11.20pm.Regardless of the fact that it quite clearly stated that last orders would be called at 12.00am.Entertainment was offered by way of a HiFi blaring out Spanish music from 11.00am till close of the day. (music in a box)This hotel is not for people who find it hard to walk as it resides on a rather steep hill.No matter what direction you may choose to attack it from, the only way is up the hill.The three stars allocated to this Hotel should be reviewed by the Spanish tourism board and marked accordingly.In our opinion it should be allocated no more than Two stars.You do get what you pay for.And unfortunately what ever we paid we paid to much.A Blackpool flea pit offers more pound for pound than the Hotel Samba. I stayed here for 5 days in December. Check-in was very efficient, and the foyer was clean and bright. I got room 653 on the top floor and the views of Lloret were amazing. The hotel is on top of a hill and I could see clearly to both Lloret and Fenals beaches and almost 360 degrees round the resort. I had always heard too many bad things about this hotel to even consider it in the past, but had been told by my friends in Lloret that it had improved. There is nothing drastically wrong with this hotel, and as I got a very cheap deal I would not complain too much about it. It is a 3* Spanish hotel that provides the basics. The food is edible and plenty. There is nice looking pool area surrounded by grass. They have entertainment in their “pub” which is just like all the other hotel bars in the area – lots of tables and chairs and you are not encouraged to stand at the bar. This hotel is geared to other nationalities, and does not really cater for British guests. Because the other guests (mainly Spanish and French) seemed to rush to the restaurant as soon as it opened, the food on display if you went later tended to be cold or look unappetising. There were plenty of options at all meals. You could eat something pleasant, but you just had to be aware. The only British TV was Euronews. The hotel is at the top of a hill so when you go out everywhere is downwards. Would I go back; because any hotel in Lloret is just a base for me then if I got the same sort of deal I got this time then yes. Would I stay there for my annual holiday then no. Been going to hotels now since 1976 and by far this is the worst room I have ever stayed in. Sockets held on wall with bog roll, lights keep blowing, tables in rooms I've seen better on council tips but on a plus side plenty of nice bars around hotel to drown your sorrows so please think twice about booking this hotel. p.s. no chance of a good nights sleep you have been warned. we booked a last minute, all inclusive weeks holiday to the samba as the weather was so bad here. we don't have any regrets it is what you make it. we arrived at 10.00am it was very hot, we were given our room number but not able to go in it til 1pm. so we undone the suitcases and the children went in the pool. the pool area was very nice, no lilos or balls were allowed in the pool, which made it nice for swimming and didn't bother our children. the life guard was very strick which is a good thing. the pool area is locked until 10am which means that there is no getting up early for a sun bed and there are plenty of them. our room was far too small. 4 beds were pushed together, you couldn't walk around them you had to walk over them! our room was on the 2nd floor over looking the road. it was cleaned every day.it was very noisey at night. we were next to the lift which rang a bell every time it stopped. the police were called due to arguing in the corridors. the food was horrible, it was always cold and looked like left overs from the day befor(pork chops in bread crumbs! new potatoes in cheese). there were always lots of people in the restaurant, it was chaos. for fresh cooked pork or chicken you had to wait then some one would always come and push in! we couldn't find a microwave. other reports are right about raw eggs but the chef will flip them if you ask. the snack bar was horrid, cold burgers hot dogs and pizza.we ate out a few times.the drinks are very watered down and all inc are treated as 2nd class. entertainers worked hard but it was dragged out. the victory pub is good. we had a good holiday but would not go back to the samba. 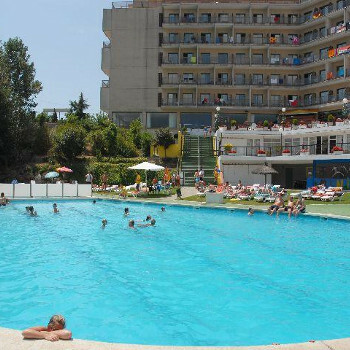 The Hotel Samba is located about 5 minutes walk away from the bars and restaurants in Lloret. We found the hotel ok, although the entertainment was absolutely rubbish, I don't know if this was due to it being the end of season or not. We did find that the hotel catered for the Germans & Spanish guest rather than the English. There was lots of noisy people who had no consideration for others, who came in at 5am and then decided to put on there Stereos full blast. I took a pair of ear plugs with me, which I wore every night they did help. When you went to the bar at night, there was only 1 or 2 people serving for the All Inclusive, yet there was 4-5 serving at the bar where people were Half Board, they did allow each person to get 2 drinks each. The good thing was that the Pool was locked until 10am, so this stopped people getting up at 7am to put down their towels. 9am would have been a better time but by the time you've got up and gone for breakfast it was almost 10am. There was always plenty of sunbeds, the only downfall was that the beds were on Grass, which was watered every morning so you do get muddy feet. On the whole we thought the hotel was ok, the rooms were clean and tidy, we had 3 single beds in our room and still had plenty of room left to move about, my 2 children enjoyed their weeks holiday. Having read several reports about Samba I was not looking forward to going, but the hotel itself was clean with lovely views. The food was of a good standard with plenty to choose from, You would never go hungry. A short walk from the hotel they is plenty shops and bars to choose from. Our holiday at the Samba was a great break and it shows dont believe everything you read! Where to begin!! NEVER I repeat NEVER go to this hotel! The standards of hygiene were apalling! The room stank like it was growing mushrooms! The paint was flaking off every surface & to top it all there was a 5 inch round punch hole in the hotel room door where someone had tried to punch their way in! Whilst we were down at reception 1 gentleman was reporting items being stolen from his room whilst another man was complaining about the state of his room! The staff were uninterested and advised him to contact his holiday rep!! FOOD!! I'm not actually sure that that is an apt description for what they put out! Raw hotdogs and burgers at the pool bar & lovely see through raw "fried" eggs for breakfast with bacon you could glue stuff together with! The entertainment was purely Spanish and so were the rest of the patrons grumpy Spanish pensioners who have no manners! Would I vist this hotel again....? Yes if someone had a gun to my head other than this I'd rather sleep on the beach!